There’s no better way to discover Saudi Arabia than by criss-crossing the country via its numerous highways. Saudi Arabia possesses a variety of road trip-suitable routes, from straight shots across deserts to snaking switchbacks through the mountains. There’s a road out there for anyone seeking adventure. It’s time to head out on the road and let unexpected diversions and detours (and maybe even a dirt path) add drama to your journey. The hot springs boast a dramatic landscape, with hills on one side and marshy ground covered with radiant green grass on the other. Part of its charm is its isolation and the fact that there has been minimal development around it. This hot spring with its ideal bathing temperature is the perfect place to relax and ease your aching backs. It can also be enjoyed year round. So prepare to get soaked on this road trip! To Get There: Catch the Jeddah-Jizan Highway. After covering a distance of 215 kilometers, you will come across a major intersection with a road that leads to the town of Al Lith to the west and a road that heads towards the village of Gumaygah and beyond on your east. From there, set your odometer to zero and follow the road that heads east. When your odometer clocks 49 kilometers, look out for a road on your left and you will see a road that heads down into the valley. Follow this road until it reaches a dead end. Reach there and you will be a stone’s throw away from the hot springs. The appellation of a “Desert Kingdom” carries the emptiness of infinite sand attached to it. This is by far the longest road trip on our list, but is worth the cross-country east-west travel. Plenty of highlights along the way ensure that you’ll want to take several days to explore this route that passes through basaltic lava fields, desert dunes, numerous oasis and ramshackle villages. It is believed that the ancient Arabian city of Gerrha existed at this very spot. Today, a colonial fort survives, which highlights the grandiose of the rich trading center the place had become in the 19thcentury. The fort is strategically located between the fertile oasis of Al Ahsa and the enigmatic Arabian Gulf. It formerly acted as a gateway for traders to the whole of Arabia. Surrounded in murky history, this isolated fort is a compelling place surviving the harsh shifting desert sands for centuries. Though depleting, trolling around the ruins of this historical fort of Uqair is a fascinating experience, where one can relive a bygone era. To Get There: Head to Dammam following the cross country Jeddah-Dammam Highway that passes through Riyadh. 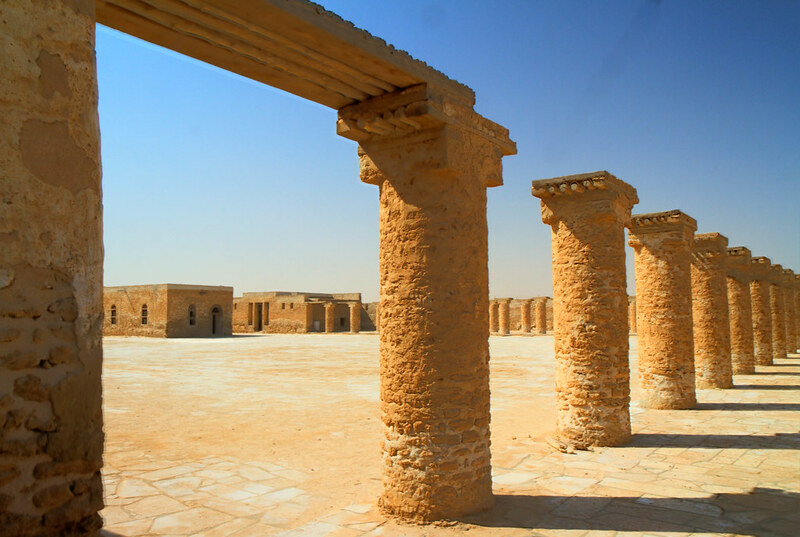 Approximately 265 kilometers after Riyadh, you will reach the village of Judah that sits by the highway. Once you pass through Judah, catch the second exit that leads towards the town of Buqayq. From the town of Buqayq, head east and after about 100 kilometers you will arrive at a major intersection. Take a right from this intersection and head straight until you come across an exit that reads Uqair Beach. Take this exit and head straight on this road. This road will ultimately end at a roundabout and from there you will be able to spot the fascinating fort on your east. Road trippers can expect some majestic mountains and breathtaking scenery on this one. This roadtrip will take you to the top of the Sarawat mountain range on a road that has short, straight sectionsand subsequent hairpin turns. And after every hairpin, a new view reveals itself: vast, cocoa-colored mountains fading to a hazy blue, bisected by a thin gray road. Just before entering the town of Taif after you have completed your ascent to the mountain city, you’ll want to stretch your legs and enjoy the stunning views of the Hada Valley down below. At the fresh fruit market you can expect to see a myriad of colors created from the variety of fruits being offered. Fruits such as red berries, apricots, cactus fruit, pomegranates and loads of other drool-worthy seasonal fruits are offered by cordial vendors. This isn’t a road trip for speed demons; to truly experience the place, slow down and let your appetite guide your way. To Get There: Head towards Makkah from Jeddah. As soon as you reach Makkah catch the outer ring road. While on the ring road you will see signboards that read Taif. Follow the signs towards Taif and you will come across a highway that ascends through the mountain range. Follow this highway and after completing your ascent look towards your left and you will see the colorful fruit market sitting on the outskirts of Taif. The fruit market is located about 150 kilometers from Jeddah. Well, this is a road trip of a slightly different kind. It involves transporting your vehicle via a ferry to the mesmerizing Farasan Islands, which are located right in the center of the Red Sea, standing as a partial bridge between Africa and Asia. The picturesque Farasan Islands are blessed with a diverse fauna, the most prized of them being the Arabian Gazelle. Farasan Islands are one of the last places on earth that the Arabian Gazelle survives. So roam around the archipelago’s isolated white-sand beaches, pristine marshes, sleepy villages and sand dunes in search of this rare breed of gazelle. They are quite difficult to spot, so you can be assured of it consuming a considerable amount of your time before you actually come across one. To Get There: Head to Jizan preferably through the coastal Jeddah-Jizan Highway. After traveling a distance of about 800 kilometers from Jeddah, you will reach the city of Jizan. Once you enter Jizan, catch the King Fahd Road that will lead you to the Jizan Port. Once at the port collect a ferry ticket to Farasan Islands. The ferry runs twice daily, once in the morning and once in the afternoon. A trip on the ferry is free of charge; plus allows travelers to take their cars along with them. This one-hour ferry ride will take you straight to the mesmerizing Farasan Islands. The idea of camping in the desert conjures up exotic yet vague images of nylon zip-up tents with toasty sleeping bags, a glowing fire, bowls of soup, and storytelling in the middle of an open desert. Surrounded by coffee-colored dunes and flyblown Bedouin encampments Mudhaylif is one of the best places in the Kingdom for camping. Mudhaylif is basically a small village that sits adjacent to the Jeddah-Jazan Highway. What makes camping at Mudhaylif feasible is that it is close to the highway in case of any emergencies, yet at the same time will allow you to experiencedesert camping to the fullest. The desert around Mudhaylif is not a flat sand dune desert; it has bits of green splashed around and is extremely beautiful with vistas of vast emptiness. This is a place where you will realize the joy of observing the silent dancing of bright stars on a cloudless night sky. To Get There: Head south from Jeddah using the Jeddah-Jizan Highway. After travelling a distance of 320 kilometers you will see signboards that read Mudhaylif. Follow the signboards and you will reach Mudhaylif. Once at Mudhaylif you can see the stunning desert surrounding the village on all sides. Pick a spot that you find feasible and set camp. I say to you, I definitely get irked while folks think about concerns that they plainly do not realize about.